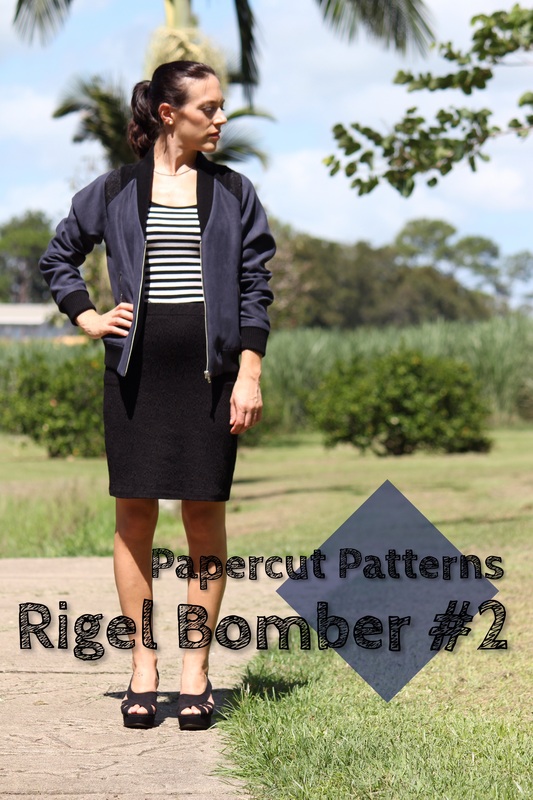 The Rigel Bomber is definitely the star of my closet at the moment! As soon as I’ve finished the first one, I immediately bought the fabric for anther one. This time I’ve gone for variation 2, the one with geometric sleeve details. I really enjoy playing with different textures, colors and fabrics and this version gives you the possibility of doing exactly that. It all begun with the ribbing, the black one I bought from Pacific Trimmings, which is super thick, very elastic and it also has a great recovery. It’s pretty heavy duty and good quality stuff and I really wanted to use it, so I looked for a suitable fabric to pair it with. Needless to say, here it’s very hard to find decent medium to heavy weight materials, never mind in a nice print or color, but I eventually managed to find something suitable for my project. This fabric is a sort of faux polyester suede in a very cool shade of dusty navy which I think complements very well the ribbing. It has a very soft hand and drapes nicely, perfect for the Rigel. It doesn’t like the iron thought as it becomes shiny if you press it too much, ask me how I know! I really liked the look of this navy paired with the black so I collected little pieces of different black fabrics for the sleeve details. I had quite a few to choose from, but in the end I set for a trio that gave me a sort of gradient effect, from light black to very deep black. For the lightest shade, which I positioned towards the front, I’ve used some black lace on top of the suede, the second triangle is made out of pinwale corduroy and the last rich black is velveteen. I’m very happy with how this color experiment turned out and I like all the pops of black on this navy background. For a more edgy look, I’ve decided to do something different with the pocket openings and inserted some zippers in place of the welts. You can find out all the details on how to do it, in this post here. While for my first Rigel I’ve purchased a Riri zipper from the US, the three zips for this Bomber are YKK, bought online from M.Recht, here in Australia. They don’t slide as smoothly as the Riri, but they’re still of very good quality and they’re way better than the zips I find locally. Of course, the zipper tapes and pocket bags had to be black! To be coherent, I’ve used some black satin back crepe for the lining and again it’s polyester. I know, I know, I’m using way too much poly these days but it’s all I can find around unless I buy online, and for this Rigel I wanted to get the right shades of black, otherwise my plan wouldn’t have worked, so it was better purchasing everything in person. This satin was very easy to work with and after this second project using this sort of material, I am now a shiny-lining converted fan – I love how elegant and luxurious it feels and looks. Bagging the lining was way easier this time, as I knew what I was doing thanks to my previous Bomber experience and also to this awesome tutorial by Jen at Grainline Studio, which shone a bit more light onto the whole process. For more comfort and durability, I also changed the lining pieces a bit, adding a 2.5 cm center back pleat and about 1.5 cm length to all pieces. Size wise, I cut an S, basically just because I wanted more ease so I could wear warm and cozy knit sweaters underneath the jacket. The difference in between each size is only few centimeters, but I prefer the fit of this second Rigel, slightly more slouchy and relaxed. The only modification I made was adding 7 cm to the sleeve length as I like my sleeves to be long and I’m now very pleased with the fit. And the black ribbing that started it all? Actually, it was way easier to handle and sew than what I expected. Obviously it was very bulky in some places, but using a walking foot was all I needed to let my little Brother sew everything without complaining. The quality of this ribbing is excellent and it looks 100 times better than the one I’ve sewn to my first Rigel. It’s sold in 80 cm lengths so I got two and I had to shorten the band pieces a couple of cm each to make them all fit. This didn’t cause any problem as the ribbing is very elastic and the size of each piece was just right – I think it looks better this way anyhow, a bit more snugly around waist, wrists and collar. I really enjoyed taking part to the #rigelbomberjanuary, it was fun seeing what other sewers came up with and it’s amazing how different is every Rigel made – from quilted fabric to leather, from wool to cotton, plain or printed, everybody’s take on this pattern is truly impressive. I’m on a serious outwear/jacket mood at the moment – I love sewing and handling heavier fabrics! – and I can’t wait to be in Melbourne to go fabric shopping and buy some coating for the Grainline Studio Cascade Duffle Coat. I totally don’t know when I’m gonna wear a coat, but I really need the Cascade in my wardrobe, it’s just perfection. So if you have a favorite fabric shop in Melbourne (or Brisbane as I might be lucky enough to stop there too!) to recommend me, please let me know, I’m so excited to put my hands on some awesome materials! 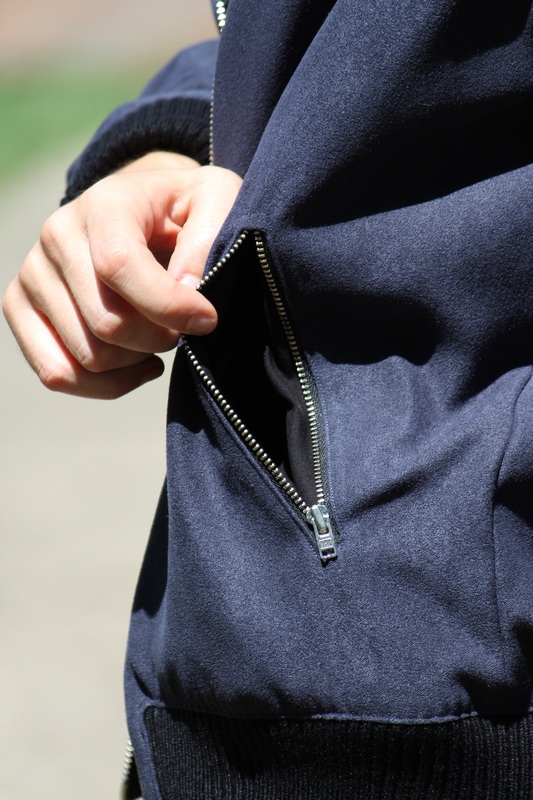 Previous Post How to add zippers to the Rigel Bomber pockets! Next Post In Swim Style! You’ve done a great job on this jacket again – how cool do you look?! Wow! This is beautiful! 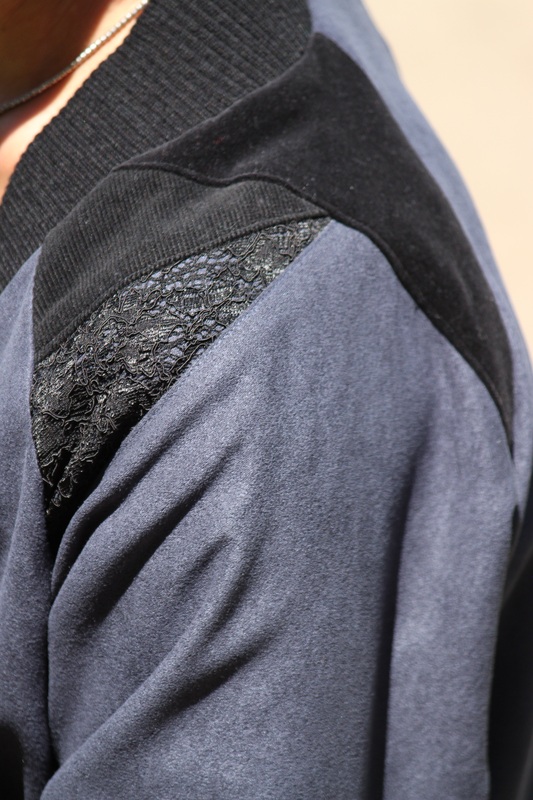 I love the way you used different textures in the sleeve detail. So cool! Thank you! I really enjoyed playing with different fabrics and I can see myself making more variations of this Rigel, loving the geometric sleeve details! HI Carly! this is a great bomber! I would like to include it in a roundup for Sew Mama Sew. please contact me at kelleyetg@gmail.com for more information. Thank you! Pingback: Winter Sewing Trends with Kelley | Sew Mama Sew | Outstanding sewing, quilting, and needlework tutorials since 2005.